The warm, loving smell of a freshly made cup of coffee in the morning is all it takes to prepare yourself for the day, won’t you agree? Apart from being a popular beverage, coffee reinvigorates the body and soul like nothing else. But making coffee in the morning, every morning – is not very convenient for everyone, especially working, busy people. Fear not – a single serve coffee machine can be your best friend on busy mornings. But what is the best single cup coffee maker to buy? Read on, and we will take you through the process in no time. 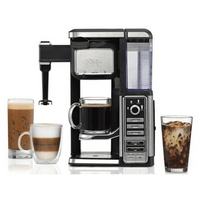 How To Choose a Single-Serve Cup Coffee Machines? 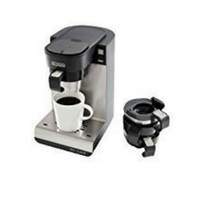 What To Consider When Buying K Cup Coffee Maker? I’ve heard that single serve coffee makers cost way higher than regular ones. Is this true? Will cleaning be an issue for my single serve coffee maker? Can my single serve coffee maker be used to make coffee for a bigger crowd? What if I can’t find pods that match my coffee maker? The BUNN MCU single cup coffee maker can brew ground coffee, K-cups, and tea bags. Its Pulse Brew feature lets you attract a bolder flavor. With a single serving range between 4 and 14 ounces, it can be a great addition to your home or office. The K575 Single Serve 2.0 Brewing Systems from Keurig is a great large size single serve coffee maker suitable for offices and bigger homes. Its 80-ounce water tank can accommodate 6 different K-cups. You also get to choose your preferred strength and temperature for the coffee. The simplest type to use, the pod-style single cup coffee makers require you to drop pods or capsules filled with ground coffee into them. The most popular model of this type is the Keurig line, which is supported by a number of other pod-style coffee makers. 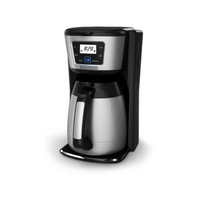 These single serve coffee makers support both brewing ground coffee and pods or capsules. These are more convenient as you get the best of both worlds and not become dependent on any particular type of coffee pods. Buying a single serve coffee maker also means committing to that brand for pods or capsules used to make the coffee. These can range anywhere between $0.05 and $1 per serving. For this reason, be sure to know how much it will cost to buy the pods, and calculate accordingly. Single cup coffee maker no pod is another option you can choose if you are looking for an alternative solution. How much coffee do you take every time? Do you enjoy a cup of finely brewed espresso or big, tall coffee mugs are your thing? Choose the model based on your preference. For coffee espresso machine lovers, a 4-5 ounce cup per serving may be enough. On the other hand, for a larger travel mug, you should choose a model that can serve up to 10-12 ounce per brew. Unlike many other electric appliances, performance of the k cup coffee makers depends on a lot of the power supply. To keep the speed and temperature of the brewers optimal, you should pick a model that can handle power around 1200 to 1500 watt. Noise is a major deal-breaker for many – so make sure your best single coffee maker makes little to no noise. Some models come with automated features, like sleep mode, preheated water tank, and scheduled coffee making, which can come in real handy. Imagine waking up in the morning to find a hot, freshly made, delicious cup of coffee waiting for you! The main purpose of single-serve brew coffee was to eliminate the many different and often useless options that regular coffee makers come with. Find a no-nonsense model that is easy to use and comes with little to no fancy features. The best one cup coffee maker usually makes a single type of coffee. If you are coffee lovers likes to drink espresso, make sure you are buying a model whose primary specialty is making single cups of delicious espresso. There’s no point in buying a fresh coffee maker that does not suit your taste, right? Even though single serve coffee makers are quite small in size, to begin with, make sure you have enough space to keep it in your kitchen or office before buying. Also, keep in mind its portability since you will likely be carrying it around a lot. There are a lot of fancy single cup coffee makers in the market that come with a higher price tag and can be way out of your budget. Keep your expectations grounded, and buy a model that serves your purpose within your budget. As mentioned above, single cup coffee makers often need pod coffee or capsules to go with the coffee machine itself. For this reason, buying a rare brand can be a bit inconvenient, simply because you will have a hard time finding the right accessories. The best thing about single serve coffee makers is the convenience they bring with them. These are very easy to handle, requires minimal effort, and gives you a hot, delicious cup of coffee every time. Carrying around your own little coffee brewing machine is a great coffee experience. A delicious cup of coffee in between your travels can really make your day, and reinvigorate the mind. There is no limit to your creativity when you’re using a single cup coffee maker. You can experiment with taste and flavor any way you like, and would probably end up with a unique brew every time. this machine are super easy to clean, requires very little maintenance, and can be stored pretty much anywhere you like. It is true that single cup coffee makers, especially the ones using pod coffee, cost a bit higher when you compare them to regular ones. However, if you take into account the waste and hassle that come with regular coffee makers, we’d say the k cup coffee makers is worth it. Most single serve coffee makers come with detachable container and coffee filters, which makes them very easy to clean. While some models are designed for serving 4 to 12 cups of coffee, most models serve a single cup in one go. If you’re going with a popular model like keurig coffee, chances are that pods will be available at your nearby supermarket or online. For less popular models, if you can’t find model specific pods, there are generic ones available in the market as well. The Keurig K55 is the perhaps the most familiar single cup coffee maker there is. It comes with four of Keurig’s patented K-cups, and a 48-ounce water tank. It is ridiculously easy to clean due to its descaling feature, along with an auto-off function to optimize energy usage. 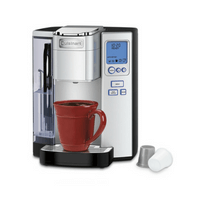 The BUNN MCU single cup coffee maker that can brew ground coffee, K-cups, and tea bags. The single serving range capacity is between 4 and 14 oz., which take just around a minute to brew. A nice feature that comes with the BUNN MCU is Pulse Brew that can extract a bolder flavor. For office or personal use, this coffee maker is a great option to try out. 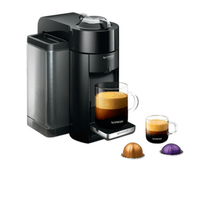 A two-in-one machine for making both Espresso and coffee, the Nespresso VertuoLine is one of the best that come with capsule recognition technology for blend-specific brewing. The capsules are available in two sizes – small ones for Espresso and large ones for coffee, and very easy to insert and eject. All it takes is the press of a button for a delicious cup of coffee or Espresso! Another great model from Nespresso, the Inissia Espresso Maker can make both the Italian style lungo coffee and Espresso. 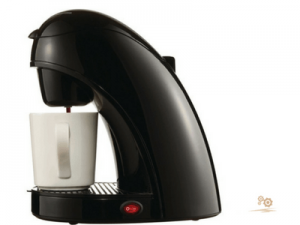 With a preheat time of just 25 seconds, it features fast and compact brewing. 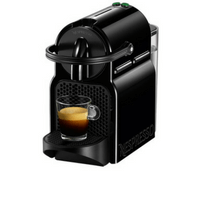 This Nespresso coffee maker features two dedicated buttons for lungo and Espresso. With an auto shut off feature after being inactive for nine minutes, it is energy efficient as well. The Cuisinart SS-10 Premium Single-Serve Coffeemaker serves you tea, instant coffee, cocoa, or even soup at just the press of a button. It comes in five different cup sizes ranging between 4 and 12 ounce. 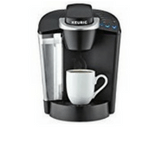 This brewer is K-cup compatible and has temperature control, and auto on-off. 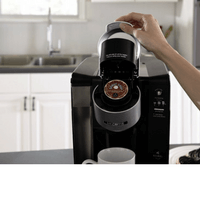 These single serve coffee maker is powered by the brewed coffee Technology from Keurig. It comes with a 40-ounce water tank, and 3 different brew sizes at 6, 8 and 10 oz. 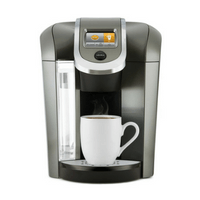 Put you K-cups for tea, coffee, or cocoa, and get a lovely cup of beverage within a minute! the Hamilton Beach 49981A Single Serve is one of the sturdiest coffee makers on this list because of its stainless steel build. You can brew ground coffee up to 14 ounces in it for a leisurely sipping or on the go. It also comes with a built-in coffee mug stand. 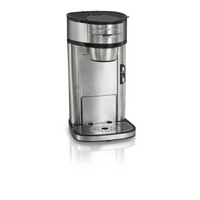 The K575 Single Serve 2.0 Brewing System is touted by Keurig as the ultimate coffee maker. And looking at the features, we find it hard to disagree with them! This monster of a coffee maker comes with a big 80-ounce water tank and 6 different K-cup pods. You can not only control the strength of the coffee but choose the temperature you want it at from five different options as well. If you don’t like coffee makers with pods and want something a less complicated, then the Coffee Bar Single-Serve System with Built-In Frother is for you. Ninja Coffee Bar Single-Serve System is the top coffee maker with no pods that are equipped with a built-in milk frother. It also comes with both custom and signature brews for you to choose from. The 12-Cup Thermal Coffeemaker from BLACK+DECKER can serve up to 12 cups of the thermal cafe that maintains an even taste and flavor. It is excellent in its design as its wide-mouth opening makes it easy to clean, while its no-drip spout lets you pour the perfect cup of coffee without spilling. As for our recommendation, for smaller single serve coffee makers, the BUNN MCU single cup is our favorite. BUNN MCU single cup coffee maker can brew ground coffee, K-cups, and tea bags, and can extract bolder flavors if you prefer so. For larger sizes, the K575 Single Serve 2.0 Brewing System from Keurig is hard to beat. Black and Decker coffee maker are versatile, can hold 80 ounces of water, and lets you control the temperature and strength of your coffee. There are few things more pleasing in the morning than waking up and have a great cup of hot coffee, delicious coffee. 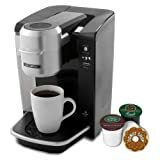 If you find large coffee pots inconvenient to use because of the guesswork and possible waste, then a single serve coffee maker is the product for you. So, what is the best single cup coffee makers to buy? Choose the best ones from our list, and kickstart your morning with the perfect cup of coffee in hand.